Increase your effectiveness and positive outcomes when working with clients who have issues related to trauma and PTSD by implementing this affordable and easy-to-facilitate program. Working hand in hand with the DVD “A Guide for Living with PTSD ” (SOLD SEPARATELY), this manualized curriculum, updated in 2016, helps addiction professionals use this treatment model with clients who are suffering from addiction and PTSD. 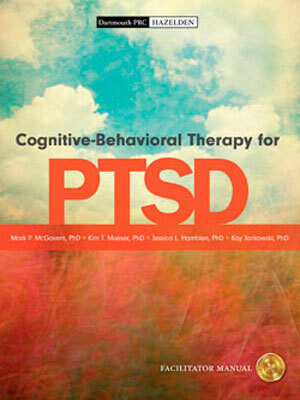 CBT for PTSD is a research-driven approach for persons with trauma-related psychological symptoms, co-developed by the Dartmouth Psychiatric Research Center (PRC) and Hazelden Publishing, leaders in the field of evidence-based programs for co-occurring disorders. Within each of the six core sessions and three optional ones, goals, timing for both individual and group sessions, and client handouts are included. Notes are provided throughout, providing tips and suggestions to maximize effectiveness. Background information on trauma, PTSD and CBT; practical considerations before and during the program; and additional resources to support your work are also included in the curriculum.